New from Trinamic; The TMCM 1070 stepper drive module and PD42-x-1070 ‘PANdrive’ TM smart stepper motor. TMCM-1070 is an easy to use stepper motor driver module. The module is controlled via a step and direction interface. Digital input to select the current control mode; StealthChop™ for absolute silent motor control or spreadCycle™ for high speed. A TTL UART interface allows for more advanced configuration and permanent parameter storage via TMCL™-IDE. The PD42-x-1070 smart stepper motor, part of the PANdrive™ range from Trinamic, combines a TMCM-1070 stepper drive module and a high torque stepper motor, providing a complete solution. StealthChop™: Extremely quiet mode of operation for low and medium velocities. It is based on a voltage mode PWM. During standstill and at low velocities, the motor is absolutely noiseless. A StealthChop operated stepper motor is therefore ideal for indoor and domestic. Also motor operation is completely free of vibration at low velocities. SpreadCycle™: Trinamic’s new patent pending constant Toff chopper system. Using the SpreadCycle™ chopper the µstep current sine wave is always well formed with a smooth zero crossing. This allows the stepper motor to be driven at very high speeds without resonance. All the CoolStep™ drivers incorporate this new technology. StallGuard2™: Trinamic’s patented stall detection is the world’s first sensorless high-resolution load detection implemented in a standard stepper motor drive. StallGuard2™ provides the ability to detect mechanical overload conditions and stall conditions without external sensors by measuring the load at a predefined point where step loss has not yet occurred. This technology eliminates the need for reference or end switches reducing cost and complexity of applications that require them. CoolStep™: Sensorless, load dependent current control using the stallGuard2™ feature. CoolStep™ enables a stepper motor to be driven in a energy efficient way. Without CoolStep™, stepper motors are driven with constant current. Trinamic’s new TMC260, TMC261 and TMC262 stepper motor drives detect the actual motor load and adjust the current accordingly. This eliminates the safety current margin and boosts the motor current when required thus avoiding step loss and stalling. Reliability is therefore improved. We are proud to announce that Micromech has been named Kollmorgen’s UK partner of the year. (From left to right) Thomas Sautter and Jan Treede from KOLLMORGEN Germany, Daniel Kollmer and Christian Reinsch from EAT, Richard Matthews and Jonathan Harding from Micromech, and KOLLMORGEN European Vice President Dennis Gallagher are looking forward to more productive collaborations in the future. 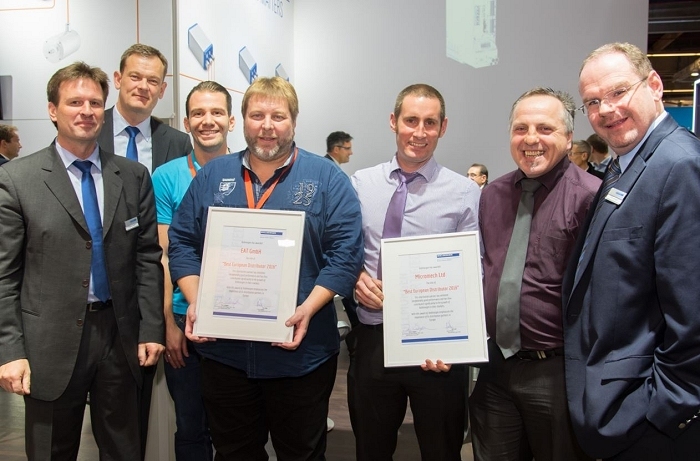 KOLLMORGEN Europe has named Micromech and Germany partners EAT their European ‘Partners of the Year’ at SPS IPC drives in November. Having focused on Kollmorgen products and achieving high sales throughout 2015 Micromech was awarded Gold Partner status at the beginning of 2016. In addition we gained Certified Channel Partner status in recognition of training undertaken during 2016 and the resulting technical expertise. We are extremely proud to be named as Partners of the year and delighted that our hard work and dedication to the Kollmorgen brand has been recognised.